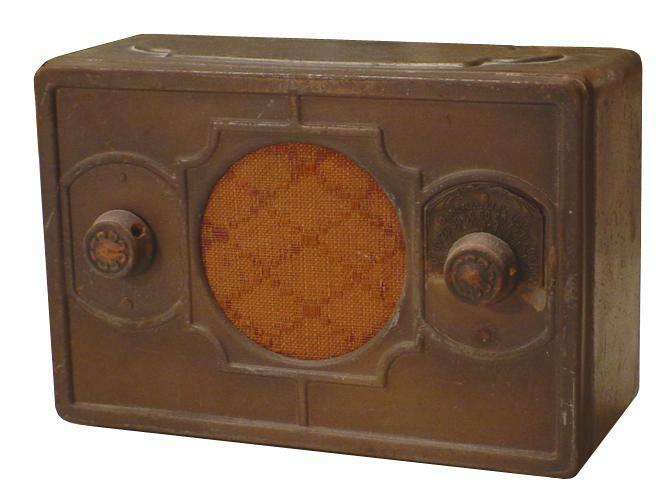 This metal General Electric is one of many low-cost "lunchbox" radios manufactured during the Depression Era. For technical repairs, the RCA R17-M schematic is used because it cross-references to the GE BX. When the radio came into my possession, the "curtain burner" resistance line cord was cut off. To fix the dropping resistor problem for the tubes; the tube filaments in series draw about 25V so a drop of about 100V is needed. I used a diode to drop 60V, and a 140 ohm 20W resistor to drop the rest. Also the 875 ohm speaker was missing so it was replaced with a 8 ohm speaker and an audio output transformer. The simple 4-tube T.R.F. (Tuned Radio Frequency) radio worked well after all these repairs.